Pilkington, George (1879-1958). Oil on canvas, signed and dated 1946. Provenance: bequeathed by Captain Hubback's widow to the wife of his nephew. 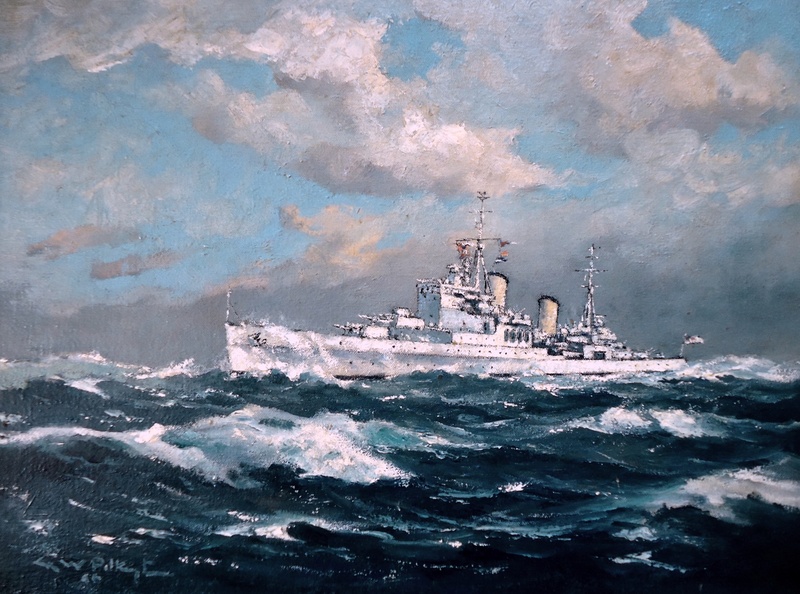 HMS GLASGOW (Captain A G V Hubback RN) a light cruiser of the Southampton Class, is painted here by G W Pilkington, a well respected South African artist. The ship had been dry docked in Simonstown naval base in early 1946 for a bottom clean and routine maintenance shortly before taking over as flagship of the Commander-in-Chief East Indies (Vice Admiral Sir Arthur Palliser KCB DSC) and it seems very possible that Captain Hubback and Mr Pilkington had met whilst the cruiser was in South Africa and that perhaps the artist had painted GLASGOW as a present for her captain (a charming trait for which Pilkington was apparently well known). We see GLASGOW here painted in her East Indies station colours: white hull and buff funnels which during the war years had been placed in abeyance, a drabber grey overall being the tactically preferred and appropriate livery. But at the time of this painting the war in Europe and the Far East had been over for many months and the Commander-in-Chief was keen to get things back to normal and so the old pre-war colours of the East Indies station were re-introduced. His Command was a vast, loosely shaped rectangle running from the RN base at Aden in the northwest down to Dar-es-Salaam in the south west and then east across the Indian Ocean along latitiude 30 degs south towards Fremantle before turning north up longitude 95E east, its eastern boundary, up through the Cocos Islands and on north to the landmass of SE Asia and thence westwards back to Aden. The RN base in Trincomalee, Ceylon (now Sri Lanka) was where his shore HQ was situated. Once the C-in-C had embarked in GLASGOW the distinguishing flag of a British vice admiral would have been flown from the foremast: the Cross of St George with a red ball in the upper canton of the hoist. Its not shown here so we can conclude that either the ship had yet to embark the admiral and his staff - or, more simply, that the artist wasn't too bothered with the finer points of naval etiquette! Having assumed duties of Sir Arthur Palliser's flagship GLASGOW was programmed for a busy round of visits and during her time carrying his flag she made port visits to a large number of places on the station in support of Colonial Office and Foreign Office policy: Mauritius, the Seychelles, Mombasa, Dar-es-Salaam, Zanzibar, Tanga, Kilindini, Aden, the Maldives, Colombo, Bombay, Karachi, Bahrain, Kuwait, Abadan, Basra, Madras, Calcutta, Rangoon, Singapore - it was a busy commission indeed!